HissTank › Compatible Military Toys › Eagle Force Returns At WonderCon 2016! Eagle Force Returns At WonderCon 2016! Our friends at Fresh Monkey Fiction and Zica Toys are in attendance at WonderCon 2016, where they have Eagle Force Returns reveals on display! It was last April when we first saw Stryker Jr. and Fireball and last January when we were first introduced to the Eagle Force Soldier. Not only are image revals of Fireball, Captain Eagle, Stryker Jr, R.I.O.T. 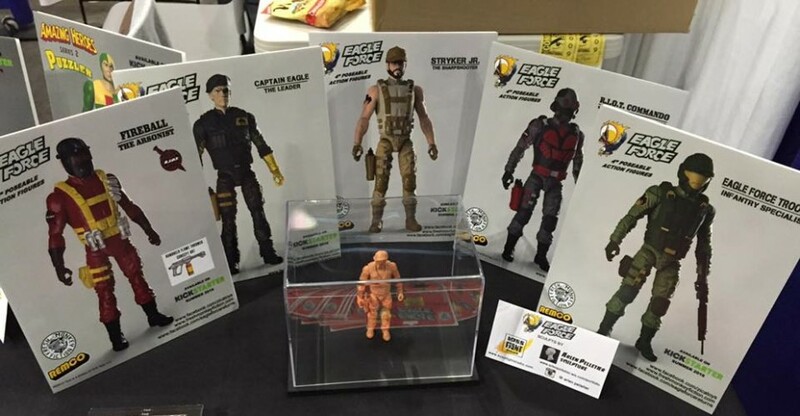 Commando and the Eagle Force Trooper available, but there’s also a Captain Eagle prototype on display! Needless to say, excitement for this line is HIGH and we can’t wait for Summer to finally arrive so that we can go all in on the Kickstarter campaign! If you’re at WonderCon, make sure to stop by and say hello! You can join the discussion on all things Eagle Force after the break!